I recently visited the Kiko store in Westfield Stratford and picked up a few things to try that caught my eye. I have seen Lily Pebbles talking about the mosaic blush but the other items are something that I haven't seen much about. Firstly, I really like the magnetic packaging of the two wooden baked products. Although rather large (maybe not great for travelling) I love the big mirror and it is quite satisfying when the lid snaps on. The bronzer is definitely a bronzer rather than a contour shade as it is quite warm. I really like it. Once you have got through the top layer, it becomes slightly less shimmery which I prefer. I don't think I will ever get to the bottom of this, it is gigantic! 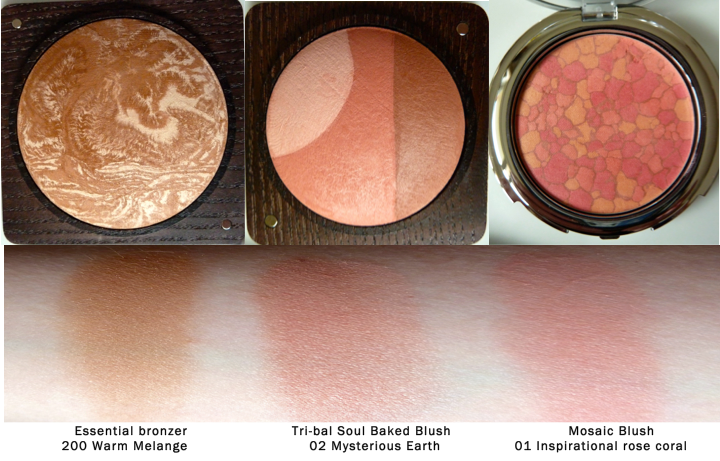 Next up is the tri-bal soul baked blush. This is a lovely peachy pink when you swish all of the colours together. You could use the shades separately as well to create a highlight, blush and bronzer on the go. The packaging for this is a good size and again comes with a handy mirror. The mosaic blush does not disappoint, the colour pay off it very good with a lovely pinky coral colour. There were four to choose from and I was stood watching these in the shop for quite sometime deciding which one to go for. I liked all of them! No.2 was also very nice but unfortunately it had sold out. Lastly I picked up the Crystal eyeliner in no.2 technological brown. I have a few eyeliners from Kiko and I really like them. This is part of the 'generation next' line which I have not tried before. It looks beautiful and the staying power is incredible. I had to scrub this off my hand after a whole day of shopping. I look forward to wearing all of these products. Kiko have brought out so many lovely things recently. Have you tried anything that you really recommend?